Did you know you have more than 600 muscles in your body? They help you do almost everything - from pumping blood throughout your body to lifting a heavy backpack. You control some of your muscles and others, like your heart, do their jobs without you thinking about them at all. Muscles are all made of the same material, a type of elastic tissue similar to the material in a rubber band. 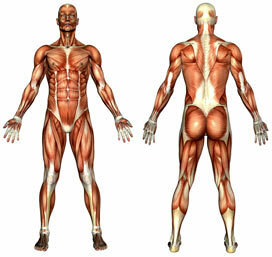 Thousands of small fibers make up each muscle. You have three different types of muscles in your body: smooth muscle, cardiac muscle, and skeletal muscle. Our video exercises should only be performed after evaluation by the qualified professionals at our wellness center and under their instruction. Failure to properly ascertain the reasons for certain injuries or the causes of pain may lead to further injury if these exercises are performed. Should you experience pain or discomfort while doing an exercise, stop immediately. Follow only the exercises our doctor has recommended to avoid the potential of further injury.